Amazon.com description: Product Description: How does it feel to be in a high-speed car chase? What is it like to shoot someone? What do cops really think about the citizens they serve? Nearly everyone has wondered what itÃ¢ÂÂs like to be a police officer, but no civilian really understands what happens on the job. 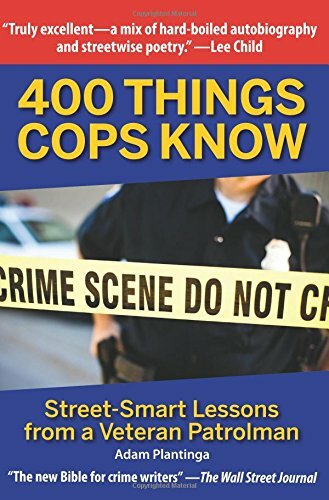 Ã¢ÂÂ400 Things Cops KnowÃ¢ÂÂ shows police work on the inside, from the viewpoint of the regular cop on the beatÃ¢ÂÂa profession that can range from rewarding to bizarre to terrifying, all within the course of an eight-hour shift. Written by veteran police sergeant Adam Plantinga, Ã¢ÂÂ400 Things Cops KnowÃ¢ÂÂ brings the reader into life the way cops experience itÃ¢ÂÂa life of danger, frustration, occasional triumph, and plenty of grindingly hard routine work. Ã¢ÂÂ400 Things Cops KnowÃ¢ÂÂ deglamorizes police work, showing the gritty, stressful, sometimes disgusting reality of life on patrol, from the possibility of infectionÃ¢ÂÂcriminals donÃ¢ÂÂt always practice good hygieneÃ¢ÂÂto the physical, psychological, and emotional toll of police work. Plantinga shows what cops experience of death, the legal system, violence, prostitution, drug use, the social causes and consequences of crime, alcoholism, and more. Sometimes heartbreaking and often hilarious, Ã¢ÂÂ400 Things Cops KnowÃ¢ÂÂ is an eye-opening revelation of what life on the beat is really all about. About: How does it feel to be in a high-speed car chase?